I’m a huge fan of edible wedding favors and everyone loves cookies. And cute cookies are an even better deal. 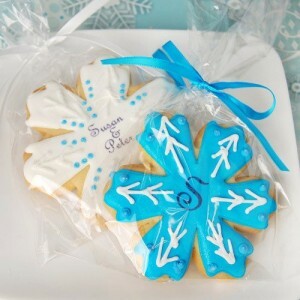 We’ve featured all sorts of wedding cookies on this site, but I have to say I’m really loving these snowflake cookies. (It’s safe to assume that I like snowflakes if they’re covered in icing). The snowflake cookies come in white, silver, or blue icing and can be personalized. And if you aren’t a fan of the snowflake design you can also order the personalized cookies in blue or red caps or blue or red mittens. I’ll admit the mittens are super cute too. These cookies would be amazing for your winter-themed reception. I found these cookie wedding favors here.